The year was 2013; a wintry Christmas Day plastered the UK. I received the PS Vita, a device that would shortly feast on my free time unhealthily. After months of playing the titles prepackaged with the Vita, I purchased Don’t Starve after hearing praise for this procedural survival sim. I made the transaction without hesitation. What followed was months of non-stop pleasure from immense dying over and over again only to unlock new characters, ultimately reaching my goal of slaying the cynical antagonist Maxwell, a supposed puppet-master who strings you along the journey. I won’t spoil too much but let’s just say once you reach Maxwell the game shifts drastically in a new direction which (at the time) blew my tiny mind. I completed Don’t Starve 2 times in the space of a year; to say I was hooked is an understatement. 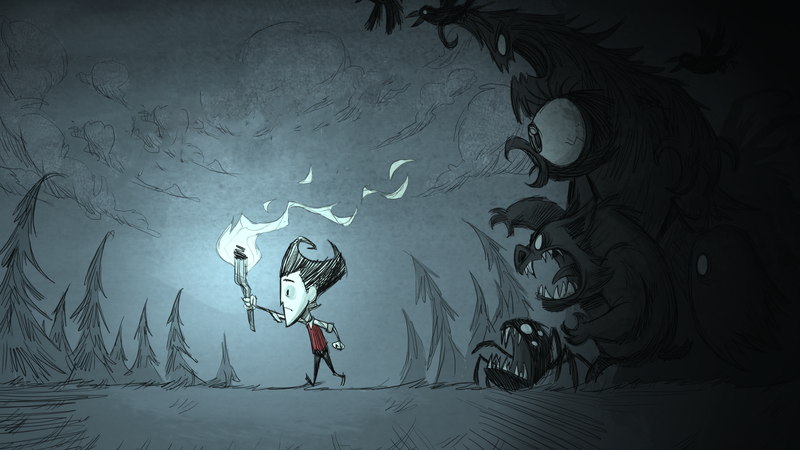 Don’t Starve thrives on creating imperishable tales; every play-through had a divergent tale to offer. Usually, they involved the games disturbed inhabitants such as the moving trees or the vexed pig-men. Its charming and prodigious world invited you to inflict yourself with mental pain every time you faced the main menu, attempting to lure you into its promise of a procedural land where it’s man vs the disturbed environment but there was a catch; the game presented itself as a chore in which you constantly gathered resources to feed your depleting hunger bar. Your sanity couldn’t drop either otherwise the seemingly non-existent shadows begin to hunt you. Eventually, I became tired of the constant grind for resources and neglected the game. Last week Steam held its much-anticipated summer sale extravaganza, swinging the discount hammer onto thousands of games, including Don’t Starve. I was reluctant at first as the game with an acerb taste in my mouth but after a solid hour of mulling, I took the plunge and purchased the Don’t Starve Alone pack which included Don’t Starve, Shipwrecked and Reign of Giants for the sum of $7. What’s not to love? During my first boot up, I missed the quirky intro in which Wilson chips away at a contraption before being plummeting into an unknown land. Instead, I was greeted by a version of Wilson who was sporting a pirate hat. He stood next to the Don’t Starve Shipwrecked logo with the phrase “home sea home” imprinted on an animated piece of paper with folded edges. Also on the menu was an advertisement for Klei’s latest title, Oxygen Not Included which hails to be a survival sim, analogous to Don’t Starve. I was eager to jump into Don’t Starve’s latest DLC, Shipwrecked as it sent a castaway vibe and sure enough the game heaves you onto shore with nothing but a couple of padlocked crates to your name. The DLC spins the conventional experience and churns it into an enjoyable experience worth the continuous grinding you’re forced to endure throughout Don’t Starve. Overall, it felt like the game Don’t Starve aimed to be. Have I mentioned the chatty parrots? The feathered creatures who happen to be vocal are arguably the best aspect of the DLC. Next up was Reign of Giants, also known as the expansion that successfully accomplished the spilling of hot chocolate after a tree man decided to make himself known halfway through my pursuits in dicing his body. After this fateful event, Reign of Giants was excluded from my play-throughs. Returning to the DLC, I now appreciate the abnormally large and predominately terrifying creatures for all their formidable worth. After dossing around in Reign of Giants and Shipwrecked I jumped ship (pun intended) to the default game to relive the PS Vita days and to no surprise, at all, I received the same experience of living on the breadline when it came to supplies. I quickly settled into the stressful lands, taking me back to 2013 when my PS Vita persona ruled the roost of my life. It was a mixed happening of jubilation, exasperation, and nostalgia; I wouldn’t have it any other way.